I planned on taking a stroll through a park today, my trusty photographer at my side (who I was to pay handsomely with home made pies), capturing staged candids of what was going to be a thoughtfully curated outfit. Then it snowed. And in my town, snow is how the best laid plans are smothered. So I looked in my closet and wondered what I could write about that I could also photograph on my own. OK. One thing you should know about me is that I am a bit of a magpie. I like and can be easily distracted -mid-sentence- by a glitter, a sparkle, a sheen and a glint. As a result, I have developed a penchant for metallics. I’ll wear metallics all day every day. And not just in the form of a statement piece with an otherwise classic outfit, say as a clutch or pumps with a little black dress. Nope. I’ll wear a rose gold sweater tucked into palazzo pants, midi length, so as not to obscure a pair of pointy toe chrome booties. You see, to me, metallics are a basic. They are a neutral. They can be worn day or night, to work or to the grocery store, in combination with the simplest or most daring of outfits. And I thought that it would be fun to show examples of the different ways metallics can be introduced into one’s wardrobe. Today I’ll start with one of my absolute favorite parts of fashion: Hoof Covers (more commonly known as shoes). Throughout this blogging journey I’m taking, you’ll see how I incorporate these into my style. My back is still sore from some of the positions I bent myself in order to take some of these photos. But the time I got to spend playing with these shiny lovelies was worth it! Do you believe in sole mates? Because I didn’t until I met these boots. Sleek on the outside, comfortable on the inside, it takes will not to continuously reach for these gems. I wish I’d had the foresight to buy two in preparation for when I run these into the ground. These boots can be worn with literally anything. OK, perhaps “figuratively” anything, but you catch my drift. As you may have guessed, subtlety is not my strong suit. So when I saw this updated nod to Barbarella I knew I had to have them. Faux leather silver, mesh and a structural lucite heel make for a shindig in a shoe so I tend to keep outfits simpler while wearing these. Usually monochrome, so the shoes shine (no pun intended) as the accessory. Loafers are a fantastic way to add a little BAM! to any outfit. Seems to me that taking a enduring style like the loafer and dressing her up in drag smacks of the yin and yang, no? 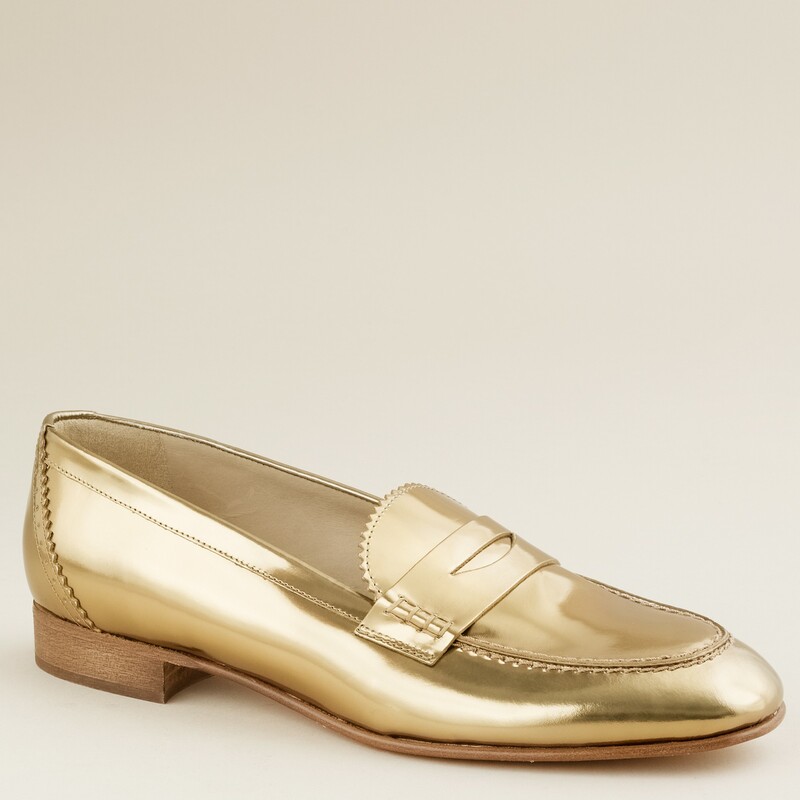 I searched high and low for those gold ones after seeing the J Crew version over 2 years ago and could not believe my luck when I found those babies for $10 at Old Navy. I’ll let that sink in for a minute. And I wear them like I’m getting paid to do it! Finally, even someone with a more casual style can find some baubles for the feet. I hope you try some bling on your hooves! Let me know down below or on any of my social media platforms how you did it. I seeing other people’s magic. Thanks for taking the time. Where are the Gucci loafers with the heel????!!!! There were so many metallic shoes, I had to pare it down. Those bad girls will get their own debut.